Alexa and Irène Brunet set off on a journey across France, following a trail of information passed by word of mouth, seeking out atypical inhabitants-citizens to discover and share their everyday lives. By a mixture of snapshots and staged settings with the subjects performing a part, the photos have shed any purely documentary content. The photography project is complemented by a series of texts which transfigure reality and describe an encounter with fantastical “inhabitants”. These poetic portraits, which combine real and imaginary, invite viewers to look at their surrounding environment with a new perspective. Through a study lasting four years, they have shown atypical living environments and ways of life. They have photographed individuals who, driven by their convictions, have decided to live in a different way, away from big cities. They have thus become makeshift builders in total freedom, alone, as a family or as a group. 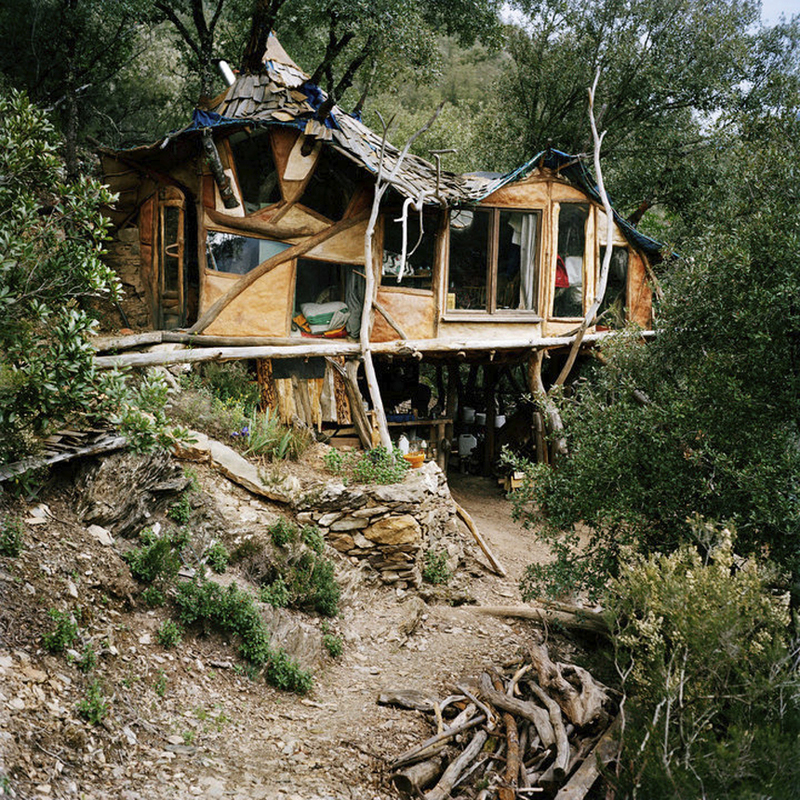 Their so-called “wild” constructions, utterly fascinating and full of inventiveness, suggest other ways of thinking and living. Bolstered by their convictions and bursting with energy and new ideas, their commitment is embodied by their actions. Respecting their convictions implies disregarding the norm; their way of being citizens and being responsible is to follow alternative ways of self-construction, and often to challenge the way our society works. Their choices urge us to raise questions about our current ways of living and remind us that living in a different way is possible. Alexa Brunet was born in 1977 and studied at the Art College of Belfast and at the ENSP in Arles. Since 2002 she has been working in the south of France where she is a member of the photographers’ collective Transit (Marseille-Montpellier) and through them she works mainly for the press. At the same time she is engaged on several photographic projects in collaboration with writers both in France and abroad. She is regularly invited to exhibit her work and to participate in artists’ residencies. Since 2009 she has been holding seminars on the image and narrative. In 2007 she co-authored with Florence Vialettes POST, ex-Yougoslavie, published by Le bec en l’air; in 2010 she co-authored with her sister Irène Habitants Atypiques published by Editions Images en Manoeuvres and in 2011, she produced En Somme with Diaphane publishers. Her photographs are disseminated by Picturetank, a source of images by independent photographers. Irène Brunet was born in 1981 and has a degree in Modern Literature. She pursued a teaching career until 2008 and then turned to full time writing and performance. She is currently a narrator and actress and works with the companies CCDM (Centre de Création et de Diffusion Musicales) and La Moutre, with which she creates her own shows. At the same time, Irène works in schools where she runs cultural workshops on storytelling, writing and children’s literature. She currently lives on the banks of the Loire and produces her theatre shows.